Before firing up the engine, I flipped the MAP adjuster switch over to the stock 5.0v setting. If I'd left the MAP sensor input voltage set at the 4.25v that I was using for my old 4.0, the stroker would have run dangerously lean. The engine initially cranked but wouldn't start. The mechanic who'd installed the engine discovered that the new cam position sensor in the distributor was a dud, so he swapped my old distributor back in and cut off the "ears" of the hold down clamp to index it. At least the oil pump was primed if nothing else! The engine was slow to start but it then fired up to an uneven idle. It would occasionally stumble and almost stall, but it kept running and the cam was broken in as per Crane's instructions. I then drove the Jeep around the block. The engine felt good and strong but there was some hesitation at low revs, and there was pinging when accelerating in 2nd and 3rd gears. It felt like the timing was off so I asked the mechanic to check it. Sure enough, the distributor was several degrees out and the timing was way too retarded. Duh! He loosened the bolt holding the distributor down and rotated it a few degrees counterclockwise to what I'd previously determined to be the correct position. I'd hit the bullseye! I started the engine again and it fired immediately. The idle was more even and the stumble had gone. The engine revved up quickly with a blip of the throttle and the torque was enough to make the Jeep sway side to side. Now we're talking, or is it torqueing? I drove the Jeep round the block again and the engine felt much stronger, the hesitation had gone, and there was no more pinging. The only fuel available here is 91 Octane (R+M/2) with MTBE. A final inspection revealed that there were no oil or coolant leaks so I settled my account with the workshop and drove the Jeep home. When I got home, the engine still idled a little unevenly between 700-800rpm but it revved up quickly with no hesitation. The Check Engine light was off and there were no fault codes. I suspected that the engine was running too lean so I raised the MAP sensor input voltage slowly to 5.3v until the idle was more even. I decided to leave it at that to allow some time for the engine's computer to adjust to the stroker's parameters. I was too excited to leave the Jeep sitting in the driveway so I went out for another drive. The exhaust sounds throatier than it did when attached to my old 4.0, and the stroker feels very strong now. The Jeep will spin its rear wheels in 2nd gear when going in a straight line, and it will even break the rear tires loose if I give it too much gas in 3rd gear when going round a curve. Overtaking on the highway in 5th gear is effortless and the Jeep will reach 100mph (3000rpm) much more quickly than it did when powered by the old 4.0. I love it! Well, still a couple. At idle, there's a soft but definite ticking noise coming from under the valve cover. I suspect that it's coming from the rocker arms and the likely causes are the extra lift of the Crane cam and the heavy duty valve springs. Time will tell if this becomes a real concern. The other problem is that the engine's running uncomfortably hot. The coolant temp. readings aren't too much of a problem (they range between 195-220*F) but the oil temp. is about 30*F higher than it was previously. It stays at 195*F on the highway but peaks at 220*F in heavy traffic. Perhaps that's not too bad considering that the outside temp. is 115*F. There may be four possible reasons: the stroker's producing more heat than the old 4.0 because of the higher compression ratio and HP/TQ level, extra friction from components breaking in could be producing more heat, the air/fuel mixture is too lean, or the cooling system may contain some air that needs to be "burped" out of it. Despite the high oil temps., the oil pressure remains at acceptable levels when the engine's hot. 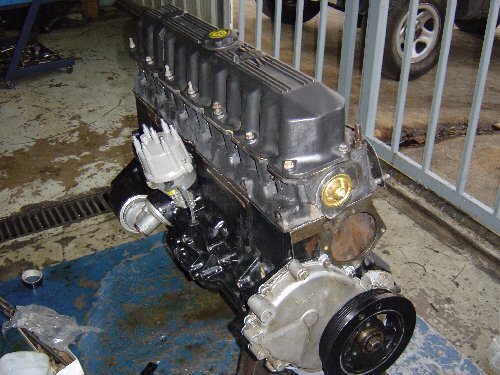 At idle it's 20psi, rising to 40psi when the engine's above 1600rpm. It's so far so good. Overall, I'm a very happy camper on Day One! To my friend Samir Fayyad for locating a cheap short block to build up, and for introducing me to his friend Mahfouz. Mahfouz was the really cool chief mechanic at Al Mataweah Groups Jeep Services in Riyadh, Saudi Arabia who supplied me with the short block and all the freebie parts. He also did the final engine assembly and installation. Al Jamah Modern Turnery performed all the engine shop work and Bajahzar Trading Est. was my principal source for new parts. Their service was exceedingly friendly. but it had to make way for a younger, more athletic, and better-looking stud! 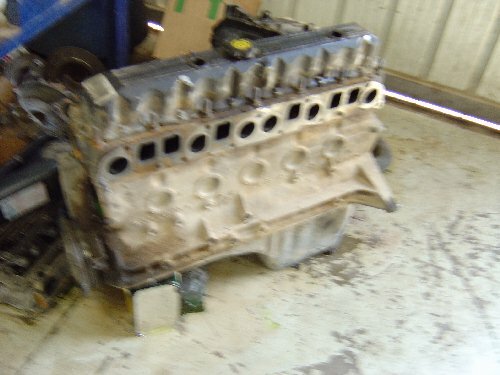 I stripped down the old 4.0L engine completely and it was in amazingly good condition for its age. I sold it to another Jeeper who also rebuilt it into a 4.6L stroker. Good on ya mate! 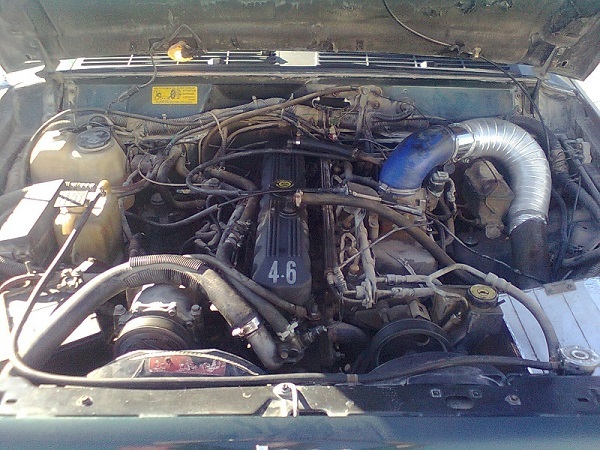 The 4.6L HO stroker is neatly nestled in the engine bay of my Jeep and looks very much at home. It looks the same as any other Jeep 4.0L engine from the outside so a smog inspector would never suspect that there's a rip-snorting torque monster under the hood.